If there is one thing I learned during pregnancy, it's that we have so little control over how the body functions. At least, that was my experience. Everyone talks about the food cravings, but I hardly imagined how powerful those cravings would be. In the second trimester, once the nausea wore off, my body craved croissants on an almost daily basis. How convenient it was that my work was located around the corner from a delicious bakery! Anyway, I would like to talk about pregnancy weight gain, not my cravings for croissants. (I'm sure the two have nothing to do with each other...) According to the Babycenter website, I should have expected to gain an average of 25 to 35 pounds over nine months, almost all of it in the second and third trimester, and the weight gain was supposed to be more or less linear. 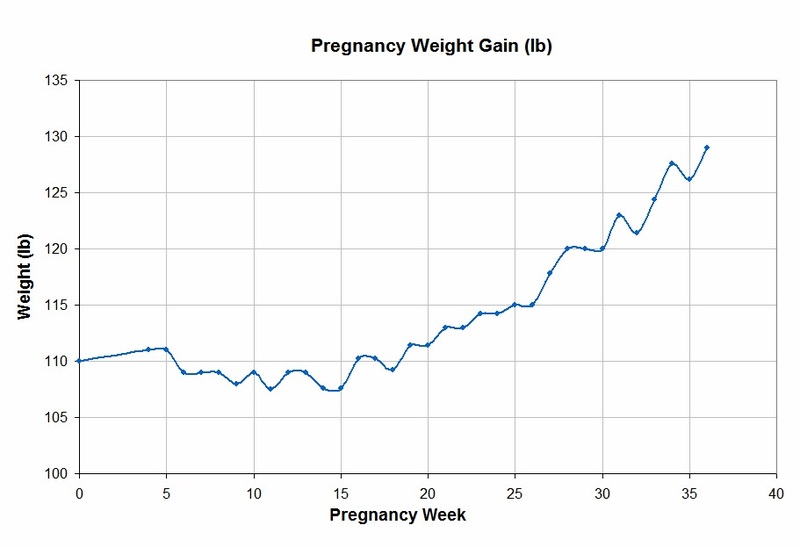 True to my nature, I charted my weight gain throughout pregnancy. 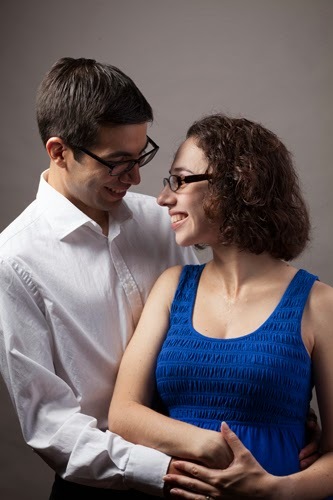 During the first trimester, I lost a couple of pounds due to constant nausea. In the "honeymoon" second trimester, which was filled with lots of energy and many apricot croissants, I only gained a few pounds. When the third trimester arrived, I started putting on weight like gangbusters (though I laid off the croissants). What I found most mind-boggling was that the weight gain had nothing to do with my food consumption. One morning, I would wake up and discover I had gained three pounds overnight. How did that happen? I was ready to pop, no doubt. (My water broke that morning, so does that mean that I had technically already popped by then?) But even though I looked huge, my total weight gain by the end of pregnancy was 19 pounds. (Note to the blogosphere: Apart from certain pregnancy forums, it appears to be taboo to discuss weight and weight gain on the internet or in real life. But I feel that there is a need to publicly discuss real pregnancies, if only to dispel the illusion of the perfect pregnancy image perpetuated by Hollywood. Every woman and every pregnancy is different, and this is only my experience which I am adding to the conversation.) How did it happen that I gained less than the recommended amount? Well, I was only pregnant for eight months, so I'm sure that had something to do with it, but otherwise, I have no idea. My body did what it wanted, and gained weight when it needed to gain weight. Babycenter kept telling me that I was not gaining enough and was putting my baby at risk of something-or-other. Let me tell you, this kind of language caused me a lot of anxiety. But I was measuring right on time, and my OB was not at all concerned, which definitely helped alleviate some of my fears, and also made me realize that Dr. Google doesn't really know what he is talking about. Now, if the weight conversation around pregnancy is taboo, it is practically nonexistent when it comes to postpartum weight loss (with the exception of a few wonderfully honest people - hi, Lauren!). Mostly, what I heard was that if it takes nine months (eight in my case) to gain all the weight, it will take approximately as long to lose it. That's what I kept telling my husband, anyway, lest he expected me to bounce back in a week or something ridiculous like that. I also assumed that as I lost the weight, I would slowly get back into my pre-pregnancy shape. That's not what happened, either. When I left the hospital, I had only lost 7 pounds (baby + placenta - all the IV fluids they pumped into me that caused my feet to be scary swollen for several days after delivery). I also looked about six months pregnant, except instead of a round, firm baby belly, I had a huge flabby sack and lots of loose skin. I had been warned about this, so even though it was shocking to see my body in such a state, at least I was somewhat prepared for it. But I was not prepared for what happened next. At nine days postpartum, I was back to my pre-pregnancy weight. It must have been the breastfeeding, because I was eating like a trucker (way more than when I was pregnant) and certainly did no exercising. I can't explain it any other way, the weight just came off. What did NOT come off, however, was my belly. Even though I had lost all the weight, I still looked four months pregnant! This I was not ready for. How do you get back into shape if you don't want to lose any weight? It turned out, as I learned later, that the uterus takes several weeks to shrink back to its original size, which is why I still wasn't back to my familiar shape at that time. So I calmed down and let my uterus do its thing. But guess what? By six weeks postpartum, my uterus was back to normal. And yet, even two months later, my body still does not look the same. Yes, I can fit into my pre-pregnancy jeans, but they look ridiculous on me. I don't know if I will ever get my old body back, and I don't know if I need to. These potentially permanent body changes were unexpected, and I may have to learn to live with them. Meanwhile, perhaps it's time to update my wardrobe.